There are countless venues ideal for Savannah weddings, including our own Savannah Vacation Rental at 109 West Liberty Street. Yet if you recently said “yes” and want to share your happiness with most everyone you know, you may need a large venue. January is a good time to plan Savannah outdoor weddings set for spring, summer, or fall. May we suggest a historic Savannah square? Several historic squares are located within walking distance of our three Savannah Vacation Rentals. The grand home at 109 West Liberty Street, which comfortably houses up to 26 guests, is just a few blocks from Pulaski Square, Madison Square, Chippewa Square and Orleans Square (which is still lovely in spite of its proximity to the Savannah Civic Center). 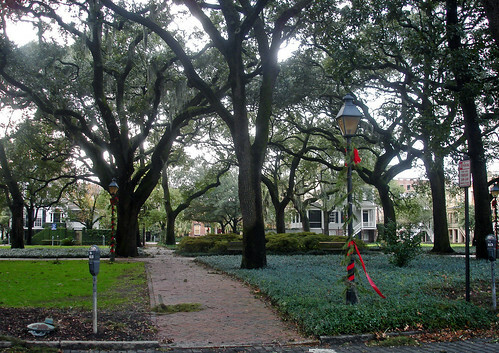 Unlike most of Savannah’s historic squares, Pulaski Square (1837) is not adorned with sculpture or fountains. The architectural space and the tall, gracious live oak trees speak for themselves and create a peaceful, shady retreat from the city. Pulaski Square is encircled by beautiful homes in the Italianate and Greek Revival Styles, most of which were built in the 1850s and lovingly restored in contemporary times. Say your vows in this peaceful place, witnessed by moss-draped live oak trees. Madison Square (1837) is home to a monument, a statue, and cannons. The large statue memorializes Sgt. William Jasper, who did not relinquish the company banner in spite of being mortally wounded in the Siege of Savannah. The two historic cannons are from the Savannah Armory and represent Georgia’s first two highways. The monument marks the southern limit of the British resistance during the Siege of Savannah (1779). Overlooking Madison Square are many fine historic buildings, such as the Sorrel-Weed House and St. John’s Episcopal Church. In the center of Chippewa Square (circa 1815) stands a magnificent sculpture of James Oglethorpe, designed by Daniel Chester French and added to the Square in 1910. Chippewa Square is flanked by the First Baptist Church, the Historic Independent Presbyterian Church, and the grand Philbrick-Eastman House. If hosting your Savannah Wedding in one of these historic squares appeals to you, by all means do. Use our Savannah Vacation Rentals as lodging for your wedding party and guests.